one homestead exemption – at their primary residence. transferable when an applicant moves to another residence; they must reapply at the new home. DeKalb homeowners receive an assessment exemption of $12,500 for School and $10,000 for County levies (except bonds) and $2,000 for State tax. All homeowners are eligible if they own and occupy the home on January 1 of the year of their application. It grants the freeze for the county assessments. There are no age or income requirements. State tax. It grants the freeze for the county assessments. Homeowners who have reached the age of 62 as of January 1 OR are 100% totally and permanently disabled may be eligible. There is a household income limit of $16,000 (Gross Income). Reduces taxable value of property by $22,500 for School taxes, by $10,000 for County levies (except bonds) and by $2,000 for State tax. It grants the freeze for the county assessments. Homeowners who have reached the age of 65 as of January 1 may be eligible. There is a household income limit of $10,000 (Georgia Net Income). Social Security benefits and most retirement income up to $60,312 may be excluded when calculating income. Exempts the recipient(s) from all School and State taxes, and increases the exemption to $14,000 for all County levies and grants the county assessment freeze. the freeze for the county assessments. Homeowners who have reached the age of 65 as of January 1 may be eligible. There is a household income limit of $16,000 (Gross Income). Increases the exemption to $22,500 for School taxes, $14,000 for all County levies and exempts all State tax. It grants the freeze for the county assessments. Homeowners who have reached the age of 70 as of January 1 may be eligible. There is a household income limit of $80,124 (Federal Adjusted Gross PLUS Municipal Bonds). Exempts the applicant(s) from all School and State taxes, and maintains the exemption of $10,000 for County levies (except bonds). It grants the freeze for the county assessments. D – Loss or loss of use of one lower extremity TOGETHER WITH loss or loss of use of one upper extremity which so affects the function of balance or propulsion so as to preclude locomotion without the use of braces, crutches, canes or a wheelchair. NOTE: This exemption may be transferred to, or applied for by, the unremarried widow or widower of a disabled veteran. This exemption is also extended to the unremarried surviving spouse of a US service member killed in action. It grants the freeze for the county assessments. income. It grants the freeze for the county assessments. Exemption for un-remarried spouse of Peace Officers and Firefighters killed in the line of duty --- Provides an exemption for the un-remarried surviving spouse of a peace office or firefighter who was killed in the line of duty for all ad valorem property taxes. This will not affect any special assessments assigned to the property (sanitation, storm water or streetlights,etc.). This exemption must be applied for in person. 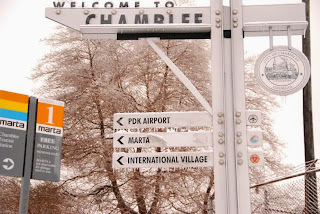 In October 2015, the City of Chamblee launched Chamblee Connect, the official platform for residents to access their government in a single location. With this new tool, residents can submit, track, and view nearby service requests through their smartphones and online. Residents can also use the in-app widgets to find information about events, public facilities, trash pickup, and more.